This Interview was conducted by the Occupied Times and is re-posted from ZNet. Since 2008, the latest crisis of capitalism has given birth to a new wave of horizontal and collective forms of organising in the United States: The occupation of the State Capitol of Wisconsin in early 2011 in opposition to Governor Scott Walker’s plan to drastically reduce collective bargaining rights. The Occupy movement and its notorious occupation of Zuccotti Park in late 2011, followed by similar occupations of public space across hundreds of American cities. And most recently, the network of relief hubs, organised at a community level and aimed at cultivating an atmosphere of mutual aid in the aftermath of Hurricane Sandy. Indeed, Occupy Sandy has been at the forefront of filling the gaps where the state seems absent. The last few months has witnessed the development of tools for debt resistance, exemplified by numerous debtors’ assemblies held in city squares across America, and more recently by the Rolling Jubilee, which aimed to display the power of collective refusal of debt peonage. One unifying thread that runs through these recent and varied forms of collective organisation is the lack of institutionalisation. In fact, institutionalised forms of collective bargaining have been declining for some time. Today, US union membership is lower than at any other time since 1933. Losses in private and public sector unions saw total union density fall from 11.8% to 11.3% last year. Meanwhile, anti-union laws are being pushed through state legislatures, most recently in Michigan. One of the most prominent voices in the debates around collective bargaining and organising has been the MIT linguist and long-time political commentator Noam Chomsky. Recently, the OT sat down with Professor Chomsky in the hope that he might provide a few insights into recent developments on the American Left, and into conservatives’ fight against unions. Below are excerpts from the conversation, lightly edited for length and clarity. OT: After Hurricane Sandy, New York City seemed to turn into an authoritative vacuum. Nobody expected much help from the feds. Do you think that Occupy Sandy can capitalise on that feeling? OT: So, Occupy Sandy and these various movements that have come out in the last year, they are double-edged in the sense that they alleviating the pressure we should put on [governments], but they are also desired responses in many ways. NC: What ways? The trouble with saying “the government backs off” is that it only feeds the libertarians. The wealthy and the corporate sector are delighted to have government back off, because then they get more power. Suppose you were to develop a voluntary system, a community type, a mutual support system that takes care of social security – the wealthy sectors would be delighted. OT: Absolutely, so it’s an interesting dilemma. 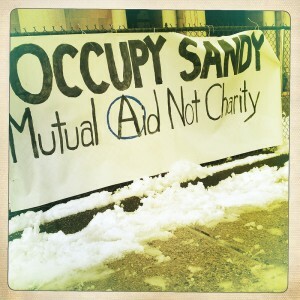 The idea of mutual aid is very prevalent within Occupy Sandy. Because of the failure of government responses, it has resulted in this thing that can potentially be used against us in lots of ways. NC: It’s difficult. In principle you are doing what a lot of communities ought to be doing. An organised community is just a government – in a democratic society at least, thus not in ours. Your problem is the effectiveness of the whole doctrinal system which has undermined any belief in democracy. You see it on the front page of every newspaper. Why is there a fuss now about raising taxes? In a democratic society, you would have the opposite pressure to raise taxes, because you appreciate taxes, taxes are what we pay for the things we decide to do. But if the government is a big alien force, we don’t want them to steal our money, so we’re against taxes. OT: The idea of taxation seems so thoroughly demonised, even though it obviously results in things that everybody takes for granted. NC: I think the demonisation is a consequence of the feeling that the government is not simply all of us formulating and carrying out our plans. If that’s what the government was, people wouldn’t object to taxes. 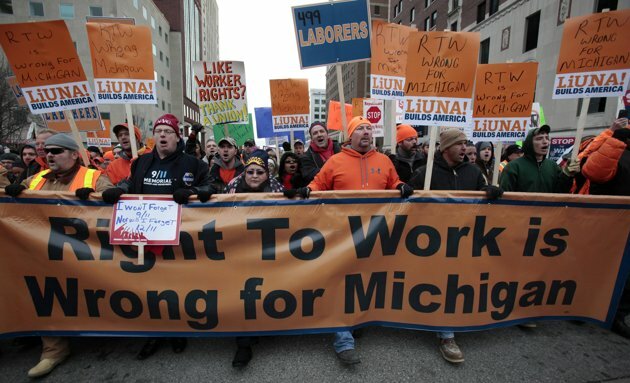 OT: There’s a lot of spillover from that sentiment – taxation and its implications for the average individual – to what we are seeing in terms of attacks on labour unions, like what just happened in Michigan. NC: Its been going on for a 150 years, and it’s a very business-driven society today. In every society business hates labour, but the United States is run by businesses to an unusual degree. It has a very violent labour history. Several times in the last century, labour has been practically destroyed, just through violence, government violence, business violence. Strikers were being murdered in the United States in the late 1930s, and in other countries for decades. Many legal instruments have been used to discipline the labour force across the USA over the past few decades. One of the most damaging forms of legislation is known as Right to Work law. It exists on the statute books of nearly half of American states, primarily in the South. Its main function is to prohibit the requirement that workers pay union fees as a condition of employment. This doesn’t prevent those who do not pay union membership fees from receiving the benefit of collective bargaining. The long term effects of the legislation, as with most laws designed to restrict labour rights, is a lowering of wages and worsening safety and health conditions for workers. Regions which utilise these laws are often dismissively referred to as “right to work for less” states by their opponents. OT: What do you think of Michigan’s legalisation of collective bargaining or in-shop organising? Did the integration of potentially radical tactics from the labour force take the ground away from under it? Or have they been normalised? NC: It just depends how it works. Legalising collective bargaining made it possible to develop labour unions, but it really depends how they work. Take the United States and Canada. They are pretty similar societies but organised labour has worked in quite different ways. The reason that Canada has a health system, and the US doesn’t, is because of the way the labour unions handled it. You had the same United Auto Workers on both sides of the border, and it was about the same time in the 1950s. The Canadian unions pressed for healthcare for everybody, the American unions pressed for healthcare for only themselves. So the Americans got a good contract, a reasonably good contract for UAW workers, but nobody else did, and so we end up with this monstrosity. Furthermore the UAW leadership weren’t just thugs, they were serious and unbelievably naive. They thought they could make a compact with management and work together. But by 1979, the head of the UAW, Rick Frazier, gave an important speech – it’s probably on the internet. He pulled out of some labour management group that the Carter administration was setting up, realising it was a farce. He said that he realised a little late that business was fighting a one-sided class war against working people, that they don’t mean it when they sign these contracts, that they are just waiting for a chance to cut back and get out of them. And he said that he had finally figured out what workers knew 150 years ago: business is fighting a bitter class war, all the time. The business world is full of dedicated, vulgar Marxists who are always fighting a class war and the labour leadership didn’t understand it, or wanted not to understand it. In any event, they entered into these compacts. Business wanted to undercut them, they did, which is what is happening. Unions were demonised by massive propaganda. We have movies, advertising, everything; it’s moderately well studied. It’s pretty dramatic when you look at it, and it has had an effect. My daughter teaches in a state college where the students are mostly working class. They don’t call themselves working class, she’s not allowed to use the term – it’s called middle class. Basically, they want to be nurses, police officers or skilled workers. She said she teaches labour history, and she says they just hate unions. Because they regard the union as something which forces you to go on strike, which steals your dues and doesn’t do anything for you. As far as that’s the case, they just hate unions. Over the past few months, there has been a noticeable focus from activists on debt and its relationship to people’s labour and livelihoods. While debt is not a new phenomenon, the level of analysis has become more detailed after the 2008 crash and the rise of the Occupy Movement. There’s the Jubilee Debt Campaign, which has campaigned for some time against sovereign debt clawed from impoverished countries. Strike Debt is developing ideas around the debtor as a new political subject. The Rolling Jubilee collectively purchased distressed medical debt on secondary markets in order to instantly write it off as an act of solidarity. These initiatives, along with the European We Won’t Pay campaign, are some of the more recent movements against illegitimate debt that have grown to prominence. OT: Looking at the Rolling Jubilee, it also is a double edged sword. On one hand you are helping someone dramatically by abolishing their thousands of dollars worth of medical debt. So instead of debt collectors buying it on the market and saying “You owe this amount of money” and giving you a principle balance and some other fee, you don’t have to pay it back. But on the other hand, you’re giving five-hundred thousand dollars to speculators on the market. OT: Absolutely. I don’t want to use the term morality, but there’s definitely a sense that it’s time to take action. That sentiment has spread. Actually I think that’s what happened in Michigan. The anti-union feeling that has been built up is, “Why should that guy over there have a pension when I don’t?” In Wisconsin, that feeling was very strong. The labour movement was never able to get across the fact that these guys are hard working people who gave up their wages so they could have some benefits, they’re not stealing from you. That never got across. So the very widespread feeling even among union members was, ‘They got a pension, they got tenure. I don’t have a pension, I don’t got tenure, I’m just after myself, I don’t care.’ And that’s one of the problems with volunteer and popular activism: It builds a sense of solidarity among participants, but it undermines another sense of solidarity in the community at large. That’s really significant. I think that’s what underlies the massive attack against social security, which is really a bipartisan attack. Obama says we have to cut it, too. There’s no economic problem, but social security is based on the conception that you care about other people. That argument has become unpopular. But you got to drive that out of people’s heads. You have to make sure not to contribute to that. OT: We were trying to think that if we had to describe Occupy Wall Street and the protests of the last year in a very succinct kind of way, it would probably be based on the idea that for generations prior there was a sense of working class solidarity and the idea of having collective power. NC: You’re right, I thought the most important contribution of the Occupy movement was to recreate this mutual support system which was lacking in society. But it has this dual character: You have to figure out ways to do it which don’t undermine the broader conception of solidarity. ‘Actual solidarity’ is the slogan of the labour movement – well, it used to be. OT: With that in mind, if Strike Debt is taking this approach where it’s focusing on debt, the commonality is that we’re not all workers, but we’re all debtors. Would you say that this is a rallying point? NC: Sure. There are many points of commonality among people, say… schools. I don’t have kids who go to school, I suppose you don’t either, but nevertheless, many of us, we’re committed to making sure kids go to school. We’re part of that community and lots of other communities. OT: But it’s much easier to say, “you’re a worker, you sell your labour for a wage.” It’s much easier to say that than it is to say: “You owe a debt and you have a solidarity to this person who also has debt.” How do you articulate that bond of solidarity? NC: That’s the obvious point of contact. That’s the way health organising ought to work: Everybody is going to face health problems. OT: It’s obvious that there is a need for that kind of thinking. But I’m not sure that it’s so obvious that you could communicate it to people and get people out on the street and organising amongst themselves. NC: Well, you know, it certainly happened in other places. Again, Canada is not that different but at least it had something of that concept of solidarity. That’s how they got a national health system. Actually, one of the amazing things in Michigan is how the unions were never able to get across the point that even the concept ‘right to work’ is a lie. It’s ‘right to scrounge’. It has got nothing to do with work, but they could never get it across. When you mention that to people they say “yeah, I never thought of it”. The same thing is to be done about debt, as I’m sure you’re doing it. A lot of the debt is just totally illegitimate. Take student debt. There’s no economic basis for it, it is just a tactic of control. You can prove that there’s no economic basis. Other countries don’t have it. Poor countries don’t have it, rich countries don’t have it, it exists only in the US – so it can’t be economically necessary. The United States was a much poorer country in the 1950’s, much poorer, but it had basically free education. OT: Sure, the NHS in the UK was founded after World War II when the debt was far greater in proportion to the nation’s wealth. NC: Even in the US, which came out of the war very rich, it was nowhere near as rich as it is today. But the GI bill gave us free education. Yes it was selective: only whites, very few women, but it was free education for a huge amount of people who would have never gone to school. In the 1940s, when I went to college, I went to an IVY league school, it was $100 tuition. That’s a poor country compared to today’s standards.